Our skip through La Maison du Whisky’s Artist Series 8 continued with another Sherry dram – this time progressing to combine with peat! A solid dram just bursting with character… full flavoured and really quite fabulous. 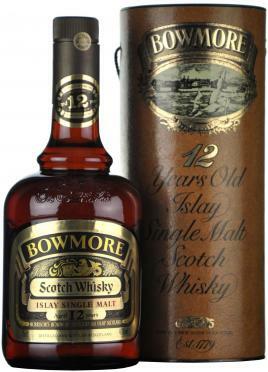 As for what this Bowmore would put you back if buying in Singapore? Don’t fall off your seat…. SGD 820. And exactly why it is terrific to try in such settings Whisky Live as waaaay beyond my pocket book! Nose – Elegant, precise. 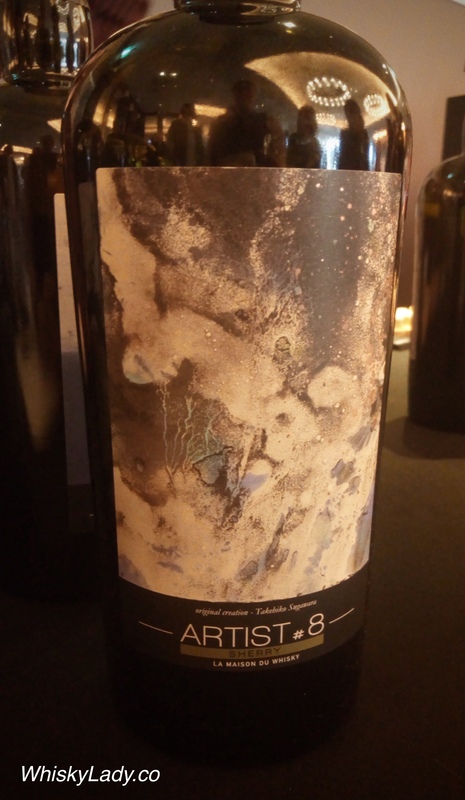 Delicately placed at the top of the aromatic palette, a peat both herbaceous (lichen), salty, smoke, iodine (spray), vanilla, floral (carnation) and fruity (pear) provides a lot of rhythm and race at the first nose. After creation, it becomes exotic (passion, guava) and medicinal (tincture of iodine). Further on, candied lemons, fresh walnuts and acacia honey underline its extreme sweetness. A fine smoky pungency highlights its remarkable fullness. Palate – Rich, concentrated. With the same elegance as the nose, the attack in the mouth is peaty / smoke, saline and mineral (chalk). More and more milky (coconut, almond). It gains unceasingly unctuousness. In the middle of the mouth, hay cut, green walnuts, almonds, candied lemons and noble spices (ginger, saffron, clove) bring a second breath to a palate that is growing in power. Very untied, the back-mouth invites us to savour a succulent rice pudding perfumed with verbena. Magnificent. Final – Long, fluffy. The start of we bite into a juicy pear. Very quickly, however, notes of ashes, soot and smoke take over the initiative with great delicacy of expression. Oily, earthy, marine (seaweed, kelp) and animal (bacon, smoked salmon), the retro-olfaction sees malted barley pointing the tip of the nose. The empty glass is herbaceous (cut hay), spicy (ginger), vegetable (tobacco), earthy (dry peat) and vanilla. —-From LMdW website with an imperfect google translation from French. There are times when a whisky sings a particular note… with such clarity and consistency that your impression of that dram is forever associated with that note. I must admit, until this Bowmore, green pepper was never such a singular stubborn element. We sampled it blind before the reveal. We set it aside and what did we find? Now before you start to think green capsicum is a bad thing, it was actually quite good! Giving even more time, we could detect a hint of ash. Even later… pickle? Yup… pickle. This is one of those whiskies which is worth checking out but… certainly not an every day dram. Instead one of those whiskies that works best when you are in the mood for it… particularly if you happen to enjoy…. yup… Green Capsicum! What do the folks at That Boutique-y Whisky Company have to say? The massively well-loved Bowmore distillery has resided on the Isle of Islay since 1779 – it’s the oldest Islay whisky distillery and it’s still going even today! The distillery is home to its very own malting floor, an eight ton stainless steel mash tun, six wash backs and two pairs of stills, which actually produce enough heat not only to make their lovely peated whisky, but the waste heat from the stills heats the nearby pool! The label features a young lad with a freshly-swiped bra from the pool’s changing rooms legging it from one of the pool’s lifeguards. Nose: Salted butter, aromatic cedar, a whiff of floral malt developing beside classic coastal air. Palate: Good cider, slightly vegetal at points, smoke meat and fried banana. Finish: Slightly oily. Sea salt, lemon-flavoured boiled sweets. So they didn’t discover any green capsicum, but can see some of the elements they found in there too. What else did we sample in our evening tribute to Jim McEwan with whiskies bottled by “That Boutique-y Whisky Company”? Every once and a while a Whisky Lady treats herself or is treated to a special whisky… and is generous enough to share it with all of the Whisky Ladies. 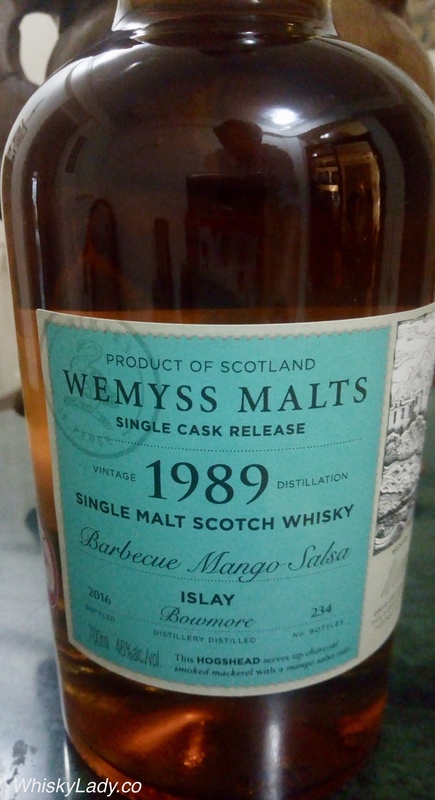 That was exactly the case for this particular 27 year old Bowmore bottled by Wemyss. Yes there is grilled pineapple and rich barbecue sweet flavours. It is indeed aptly named. And a most enjoyable whisky. Next up in our peaty minis evening after the Wemyss Peat Chimney, we explored a blend from Douglas Laing. Nose – Began with quite a sharp peat that then disappeared quickly. Baked banana or a banoffee cream pie then also settled into a surprisingly restrained fermented apple, quite sweet. What we enjoyed most about this whisky was how it kept changing. While consistently accessible – in a good way. There was overall a fresh lightness to its approach – unquestionably peat but one with a delightful ‘freshness’ and spirit. Douglas Laing’s Big Peat is a feisty Islay character with a sweet side. This is a small batch bottling, without colouring or chill-filtration and only contains Islay Malt Whiskies, including Ardbeg, Caol Ila, Bowmore and (even the now closed) Port Ellen to name but a few! Opens fresh, salty and clean on the nose, developing to sweet malt dried over peat. On the palate, detect ashes, sweet tar, beaches and smoking chimneys. The finish is long and lingering, replicating the palate with salty, tangy liquorice, smoke, bonfire ashes and a phenolic quality. 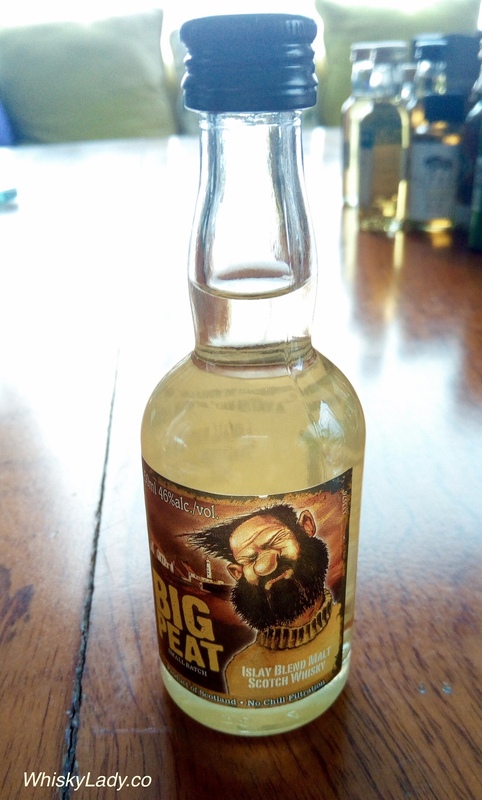 We sampled from a closed mini bottle in October 2017. While I can’t recall the exact price, think it was around £5 or so… a full bottle will set you back approximately $55. An exceedingly reasonable price for a most enjoyable dram. And what else did we sample in our merry mini malts evening? After being surprised by the Bunnahabhain Eirigh na Greine, our Islay trio continued with another dram that was a variation on the distillery style. Water – This one asked for a few drops… which transformed it into cinnamon candy, that ‘is it or isn’t it oily?’ quality clearly shifted into oils, with a soft sweetness, taking it from the territory of ‘not sure about this one’ into the ‘dangerously drinkable dram’ dimension, going from bold to subtle. Remarkable. Overall we liked it and appreciated the different layers. There was an interesting ying/yang interplay of “manly” peat with cinnamon sweet. Speculation turned to what could have made such a dram – our sense was likely a mix of sherry and bourbon, clearly peat! But which distillery? 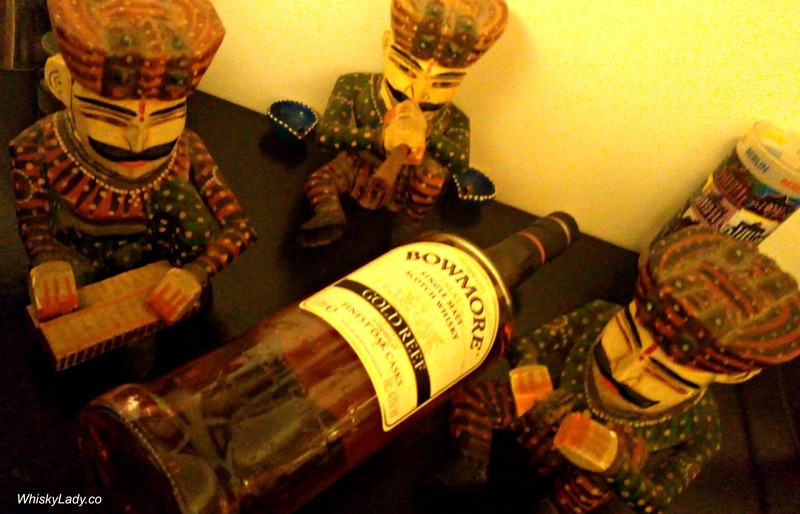 One member immediately piped up “Well… it doesn’t have a typical Bowmore character”…. So we moved on to other possible Islay distilleris but were stumped. With the reveal, I simply could not believe this was the same Bowmore Gold Reef the Whisky Ladies tried a just a few months ago in April 2017. The experience was entirely different. I had my tasting notebook and flipped back to earlier pages to read…. So we had peat, dry wood and cinnamon in common but as for the rest? It was like we were having a completely different whisky! Again… much puzzlement and head scratching… Other than the peat and maybe – just maybe – olive oil, the balance was… huh?? We began to try to find out more about this whisky. Sure enough – ex-bourbon and ex-sherry casks…. and also caramel colour. We all know palate is personal – my impression may be quite different than yours. Which is what makes tasting together so much fun – comparing and contrasting impressions and insights. Two different tasting groups. Two completely different experiences. How fascinating. What did we sample with our Islay trio? Our original Mumbai based whisky tasting club has an unwritten rule – no repeats. We also taste blind so as not to be influenced by brand or pre-conceived notions about a particular whisky or distillery. So why not have an evening that deliberately sets us up to sample whiskies we’ve had (or similar to ones we’ve tried), but each with a twist… being expressions that aren’t necessarily representative of a distillery ‘house style’ – if such a thing even exists anymore! We also observed that our impressions bore little relationship to official distillery tasting notes… Past experiments have helped provide insight into possible reasons with a range of factors including the whisky temperature, ambient aromas and environment, tasting order which can influence perceptions of the whisky to follow, conversation and company, and frankly just the mood of the taster!! What did our host “trick” us with? The more we explore the remarkable range of whiskies out there, the more we push into sometimes quite rare territory. Even expensive territory. And yet even highly acclaimed and coveted drams can sometimes lose their lustre. Old + rare + pricy doesn’t always = mind blowingly brilliant! And every once in a while it is good to have that reminder. After the truly dangerously drinkable and most enjoyable Bowmore 12 year distilled in the 1970s, we were primed to be transported to celestial levels with “The Prestonfield” vintage 1972 aka Bowmore 16 year. Yet what did we find…..? So here is the thing. The nose was promising once past the carbolic acid, an initial sip was sooty yet bland, then had a strongly ‘off’ quality. I’ll admit. I made a face. Both times I sipped. Even a bit on the 3rd when I was braced for it and ready for something decidedly different. Something like the tallow from animal fat used to make candles, that had gone slightly rancid. The most complimentary description I could think of was raw bitter chokecherries. I had to admit it didn’t work for me and tried to understand why Prestonfield whiskies are so highly rated if this was an example. What about that strange, frankly to me quite awful tasting quality, that makes it be deemed ‘good’? Just because its rare? Costs a lot? Sorry. Doesn’t cut it for me. Speculation turned to whether this bottle could have gone off – yet there was no rust on the cap and the miniature was opened just before we tasted. So…? Who knows. Perhaps something had indeed gone wrong between when initially bottled and our opening… after all, nearly 30 years had passed. Or perhaps there was some small drop of something else that got into the bottle when originally filled that turned it queer over the years. Or even still, it could be that much more discerning palates than mine found something remarkable in what to me was unusual to the extent of being not enjoyable. Do I regret trying it? Absolutely not! Would I be tempted to try again? Perhaps… just to see if something happened to this particular miniature that was not representative of the original whisky. But not enough to put a lot of effort into tracking it down. This 5 ml bottle was purchased by Krishna Nakula for £35. On Whisky-OnlineAuctions.com, the last available miniature’s bid closed at £45 in February 2015. The Prestonfield range of whiskies is without doubt one of the most well-known among connoisseurs, and yet few people are aware of its origins. 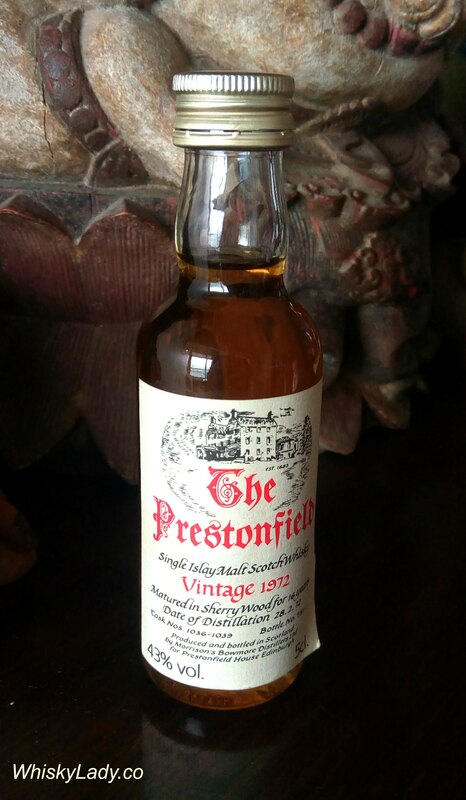 Created in the 1980s by the Symington brothers, the famous label with the drawing of the Prestonfield Hotel is now available exclusively through La Maison du Whisky. The whiskies selected for this range have always been some of the best but, from 2000, the decision was made to bottle them all at cask strength from a single cask. Almost exclusively single malts, these whiskies are extremely sought after, and often appear at the major auctions. What else did we sample in our Krishna Collection from July 2017? Much has been said about how whisky styles have changed over the decades. That opinion is widely shared by those who started their sampling journey in the 1980s where most single malts were distilled in the 1970s or earlier. Yet most of these impressions remain in memories rather than the opportunity to test the theory. Today, obtaining a sample of such earlier styles is challenging… most are found in private collections or auctions. 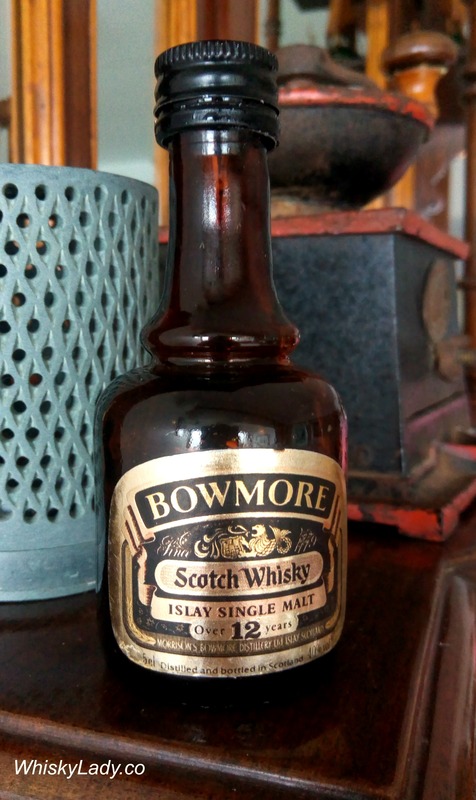 Which is where this lovely little Bowmore 12 year miniature from the 1970s came. 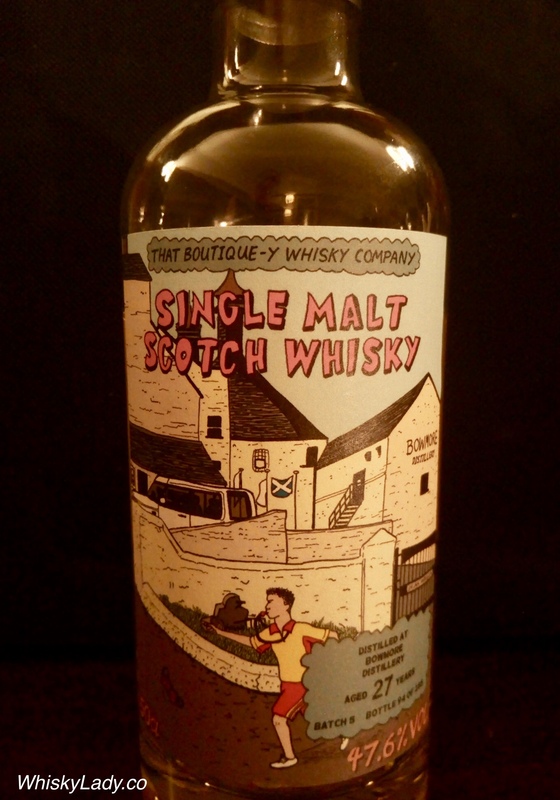 A wee dark coloured squat bottle that simply stated its age, alcohol strength and that it was matured in sherry casks. No hint of further details as this was simply a standard issue bottling for its time. This may sound a bit fanciful, but it had a joyful character on the nose, bright and fruity, superbly accessible and enjoyable on the palate with peat most pronounced in the rather delicious finish. 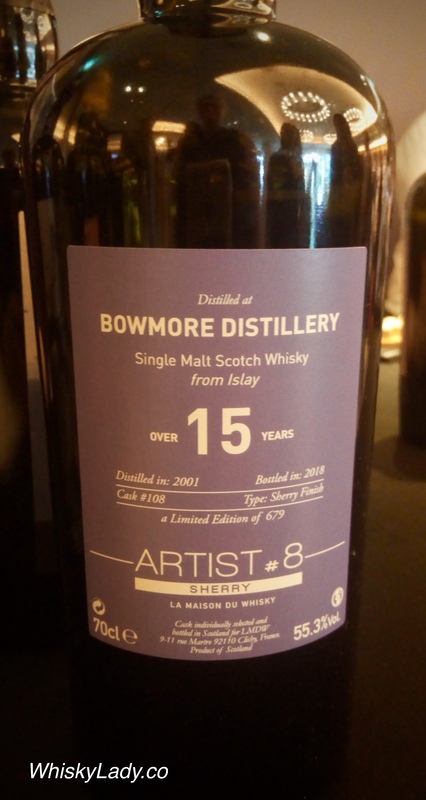 Like the Glen Grant 60 year old just sampled, this Bowmore was matured in sherry casks – but clearly of a different calibre and character than today’s sherry. Again, much more restrained overall, even the peat quality was faint – leading to speculation of re-fill sherry casks and curiosity about how the “barely there” peat quality came into play. It truly was such a contrast in style to any Bowmore sampled in the last few years – which are often quite bold in character. Whereas this wasn’t clamouring for attention by swaggering into our senses, instead gained exclamations of “Fantastic! Stunning! Superb!” for its much more nuanced dimensions. For some, it was the clear favourite of the evening – no simple feat given its competition! He went on to regale us with the tale of the term “FWP” (French Whore’s Perfume) used to describe a shift in character – particularly pronounced from Bowmore post Suntory coming into the picture for a few years. First detected by some whisky enthusiasts, they identified a peculiar soapy quality that they felt ruined the whisky… later linked to the soap used to clean the stills! The original ‘problem’ originated in the 1980’s and was corrected at some point during the 1990s. The FWP spirit sort of worked its way through the system and you shouldn’t detect the unsavoury FWP trait any more in bottlings that were released in recent years. This 5 ml bottle was purchased by Krishna Nakula for £8. For those interested, a 740ml bottle could be found on Whisky.Online.com for a mere £450. 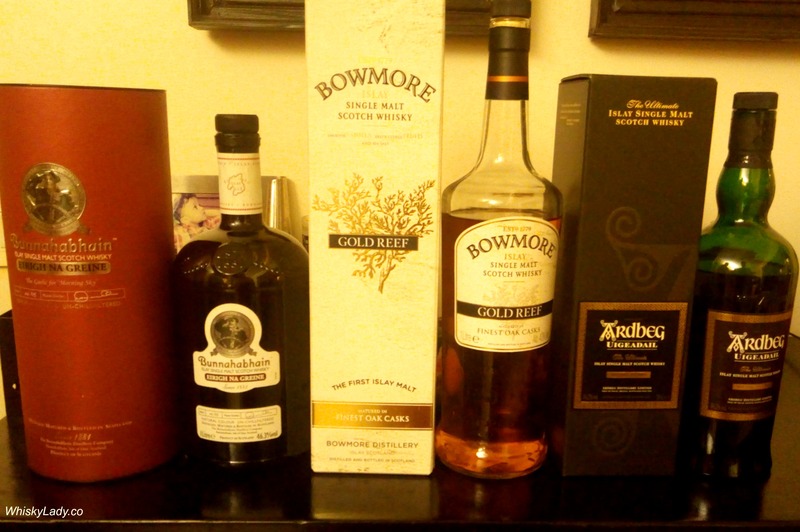 PS you can contrast my sampling of a more recent incarnation of the Bowmore 12 year here. I’d picked this bottle up in Singapore duty free back when it was 1st launched. It was one of my “speed date” sample that lead to a clear “buy” decision! And since then I’ve been patiently waiting to open the bottle with our Whisky Ladies. And what did the Whisky Ladies really think?? We LOVED it! There is something quite sophisticated about this whisky. One mentioned ballgowns and tuxedos about to take a twirl on the dance floor…. that spins into a seduction! For others it was just nice to settle down with an amiable whisky with multiple dimensions. The nose especially has such a lovely range of aromas, it is delicious to sip and savour, with a surprisingly long finish. In short – ticks the right boxes! Islay’s coast line boasts seven miles of pristine white beaches and has been the inspiration for White Sands. Matured for seventeen long years, this is Bowmore Master Distiller’s personal favourite. Matured in the finest ex Bourbon casks, the treacle toffee and ripe exotic fruits bound together by warm peat smoke. In this case, we would agree with the tasting notes… and of the three whiskies, there was zero doubt which was our favourite! In terms of the three, Black Rock is the most readily available. While not a bad whisky, it unfortunately is outclassed by the other two. Gold Reef may be slightly more challenging to find. And White Sands? Excellent value for a beautifully balanced whisky with enough character to keep you well engaged! It is certainly one to recommend to those who enjoy their whisky with a bit of smoky sweetness. 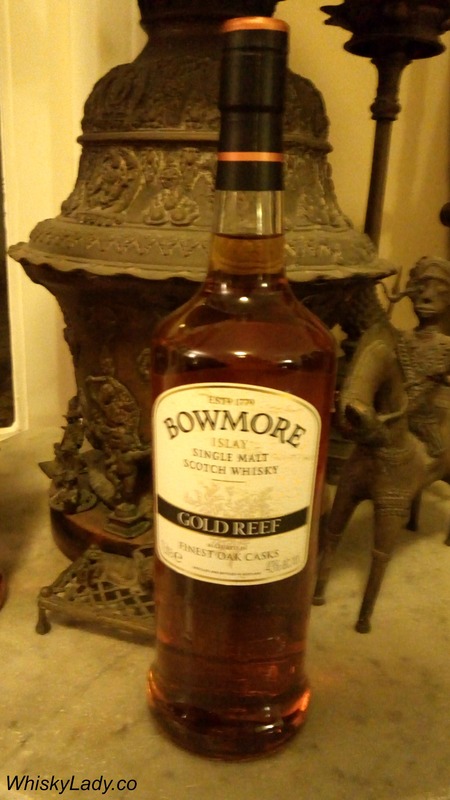 Next up in our Bowmore travel trilogy was another NAS – Gold Reef. And what did the Whisky Ladies think? We found it very inviting on the nose, the palate was such a contrast – in a good way. The finish remains. Further out to sea and deep beneath the waves lies Gold Reef. Named for the way the glow of the sun’s rays reflect off the coral seabed, this same old catches the eye inside every bottle of Gold Reef. Predominately matured in 1st fill ex-bourbon casks, it rewards with notes of smooth vanilla, citrus fruits and sea salt. Not so sure about the kiwi fruit or olive oil but certainly the balance is more or less what we found!